Thanksgiving on the first day of Chanukah. This year, American Thanksgiving falls on the first day of Chanukah. It only ever happened once before, in 1888. Thanksgiving, according to historians, is the celebration of the Pilgrims fight to escape religious persecution for freedom in a new land, the establishment of a democratic charter and the sense of Divine providence that carried those refugees through their plight. 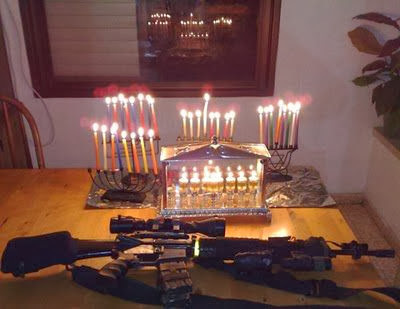 That’s Chanukah, as well: a celebration of how the Jews fought back against religious oppression in our own Land, earned our freedom and thanked G‑d for the miracles. The eight day Chanukah festival is a reminder of the Jewish people's struggle for freedom and liberty. The story of Chanukah begins during the reign of Alexander the Great. Alexander conquered Syria, Egypt and Jewish Palestine, but allowed the lands under his control to continue observing their own religions and retain a certain degree of autonomy. Under this relatively benevolent rule, many Jews assimilated much of Hellenistic culture, adopting the language, the customs and the dress of the Greeks. More than a century later, around 175 BCE, a successor of Alexander, Antiochus IV was in control of the region. He began to oppress the Jews severely, placing a Hellenistic priest in the Temple, massacring Jews, prohibiting the practice of the Jewish religion, and desecrating the Temple by requiring the sacrifice of pigs on the altar. Two groups opposed Antiochus IV: a basically nationalistic group led by Mattathias the Hasmonean and his son Judah Maccabee, and a religious traditionalist group known as the Pharisees. They joined forces in a revolt against both the assimilation of the Hellenistic Jews and oppression by the Seleucid Greek government of Antiochus IV. The Jewish revolution succeeded and the Temple was rededicated. According to tradition as recorded in the Talmud, at the time of the re-dedication, there was very little oil left that had not been defiled by the Greeks. Oil was needed for the menorah (candelabrum) in the Temple, which was supposed to burn throughout the night every night. There was only enough oil to burn for one day, yet miraculously, it burned for eight days, the time needed to prepare a fresh supply of oil for the menorah. An eight day festival was declared to commemorate this miracle. When the Macabees went out to battle, they had no feasible chance of winning. Not only were the Jews fewer and weaker than the massive well-oiled Syrian Greek war machine, but amongst the Jews themselves, only a sparse few went out to battle under the command of Juda Macabee and his brothers. Thus the essential miracle of Chanukah was not the war victory, but rather the very fact that a few Jews realized that "things just cannot go on this way", they arose, and with immense faith in the Almighty, and in an act of incredible courage, declared war on the superpower of their day. Think of it like the movie the 300, except that the Jews didn't lose! A personal hero of mine, General George Washington became acquainted with the spirit of the Maccabees, in December (Chanukah) 1777, at his new headquarters at Valley Forge, Pennsylvania, with ill-equipped, weary troops. Faced with a super-power, George III of Britain, Washington concluded that only a dramatic change could avoid a defeat. According to the diary entries of Louisa Hart, Washington told the Harts about a Jewish solider at Valley Forge who lit a Chanukah candle and explained its significance. Washington’s reaction was, "Perhaps we are not as lost as our enemies would have us believe. I rejoice in the Macabees' success, though it is long past...It pleases me to think that miracles still happen." The statue of Judah the Maccabee, the hero of the Jewish rebellion against the Syrian-Seleucid Empire known for his principle-driven leadership and daring battle tactics, is displayed at the West Point Military Academy along with the statues of Joshua, David, and other great historical figures. The relevance of Chanukah is pertinent in today as well. When masses of Islamic fundamentalist terrorists are against us, we that believe in democracy and freedom train for war while hoping for peace. So this year when you sit at your Thanksgiving table or when you light your Chanuka menorah (or both, at the same time) remember that our two nations have much in common and that we are in this fight together, emulating the Macabees and the Pilgrims in our mission for peace and liberty.